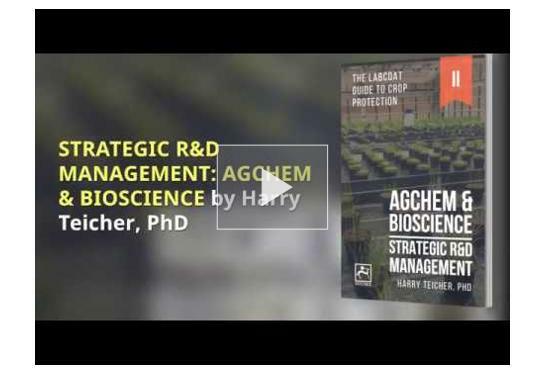 Editor’s note: This is the final article in a series of seven articles on Strategic R&D Management in AgChem and BioScience published on AgriBusinessGlobal.com. For a full list of the articles, click here. In the previous article in this series on Strategic R&D Management in AgChem and BioScience, we learned about managing innovation processes in R&D teams. In this article, we will learn about Inclusive Management Frameworks for Strategic R&D. A key issue in Crop Protection R&D is the mediation of biology-based strategies to conventional (chemical)-based decision-makers. Crop protection biologists have a unique opportunity to mediate an understanding of the drivers of biologicals efficacy and to ensure their implementation in the development of commercial strategies. For many conventional companies, this can be achieved through the implementation of Inclusive Strategic R&D Management frameworks. Traditionally, crop protection companies have favored incremental, product-orientated development. Management levels have been responsible for defining the company’s vision and strategy and for communicating this strategy in a “top-down” or “management-down” framework. In this framework, execution of the strategy is carried out by the “down” or “expert” level. This level typically has the greatest customer or end-user contact and receives important information necessary for product development. Conventional output-based project management tools and evaluations (e.g., Key Performance Indicators, KPI) are considered appropriate for incremental, product-orientated development frameworks, and are especially relevant for the “top” or management team (who after all are responsible for product output). When companies disrupt their core business and introduce innovation projects, it may become necessary to revise this development framework. An inclusive (input-based), iterative R&D Management framework and input-based evaluation can be introduced for innovation projects, to maximize the learning process while motivating the “down” or “executing” team. An example of an iterative, input-based inclusive development framework is Fair Process Management (FPM) — a process developed by INSEAD (Blue Ocean Strategy) to facilitate inclusion of Execution (bottom-up) into Strategy (top-down) by creating individual buy-in at the beginning of the process. The objective of Fair Process Management is to optimize strategic decisions by management (the “up” team) as well as commitment from those involved in execution (the “down” team). To facilitate the implementation of an input-based, iterative development framework (Figure 2), it is necessary to ensure open communication at the critical interface between strategy (vision) and execution. 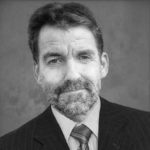 For the development of biology-based products, this requires the “buy-in” and inclusion of biology experts for strategic decisions, to the same level as chemists and chemical engineers who drive strategic decisions for conventional products. To achieve this, biological development groups should not function as support functions but should be elevated to an increased strategic responsibility within conventional crop protection companies (Figure 3, left). 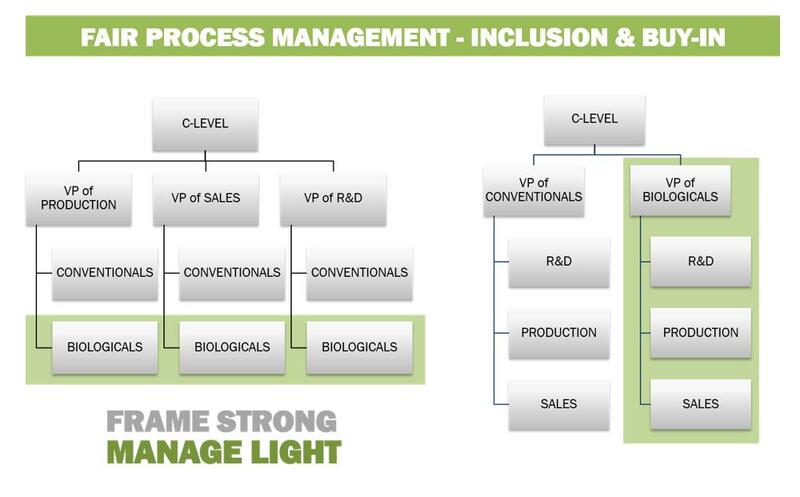 For companies investing heavily in biologicals development, it may be necessary to radically restructure the organization of the company (Figure 3, right) to adapt to the requirements for both incremental and iterative development frameworks. Figure 3: Organizational frameworks for the integration of biologicals into conventional crop protection organizations. A radical reorganization makes even more sense when we consider the economic and temporal differences between conventional and biological crop protection development. For conventional chemistries, development times can be three times longer than for biological crop protection development, while expenses may be as much as 10 times greater. Because of these differences, start-ups and other smaller, innovative companies have created a powerful and competitive environment for biopesticide R&D. 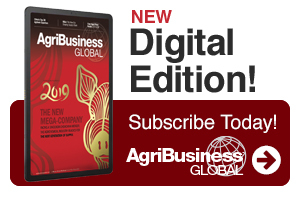 These small companies face a challenge in competing with incumbent agrochemical technologies when attempting to convince risk-averse growers to transition to this emerging technology, but also with respect to the economic requirements for efficacy testing, registration, and distribution. Current acquisitions, collaboration, and licensing agreements bear witness to the ongoing symbiosis in the crop protection market, and the need for Inclusive Strategic R&D Management frameworks as well as the mediation of biology-based strategies to decision-makers is greater than ever before.